Ah, the hashtag. An excessively overused and improperly managed tool by every bro or blogger on social media. As a key component to nearly all social and content marketing platforms like Twitter, Facebook, Instagram, Pinterest, Tumblr, and Google+, hashtags represent an incredibly important element of digital marketing. This popular symbol has become a key driver of user engagement and an integral part of any effective social media effort. As it happens, hashtags can be confusing for content marketers too. We know we need to use them, but whats the best approach? How do we determine the right tactical strategy to integrate hashtags into our campaigns that will, in turn, generate results for our brand? Hashtags originated as a way to categorize topics of conversation online so that users could track down posts related to a group or a particular event they were interested in. Currently, theyre still ideal for organizing content, whether posts apply to an upcoming conference your business is hosting, or to the product lines offered by a popular manufacturer. When you upload social media content, use hashtags to further describe the purpose and show a value proposition to your audience. For example, if your content relates to a topic like #beauty, #fashion, #business, or a #sale, say so by including a hashtag. This cohesive breakdown of subjects helps to keep your brand relevant when users search for a certain topic. Breaking down posts in this manner is extremely critical to promoting your brand content. You most likely are already including hashtags in posts that are related to your products and brand, but have you considered using them to provide additional information about each piece of content? 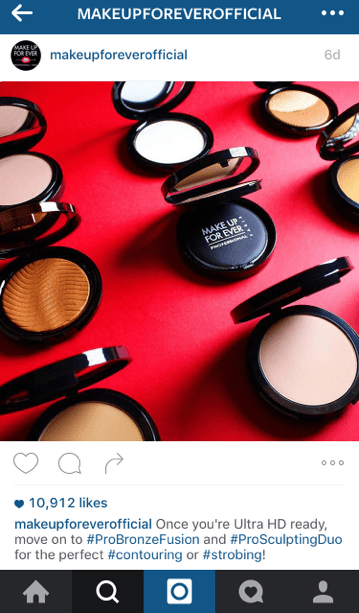 For example, Makeup Forever labels its Instagram posts with tags like #MakeupForeverOfficial and #UltraHDgeneration but also uses hashtags like #contouring, and #strobing, two trending makeup application techniques. By tagging products, Makeup Forever better defines its branded photos, videos, and animated GIFs, while the use of general beauty related hashtags makes it easier for users to find them by topic. Hashtags are useful for defining content, but they can also extend the reach of your brand as a whole. Think of them as search marketing keywords, but with one unique feature that sets them apart. Unlike the keywords in your paid search campaign, most of which are built around highly specific, less common terms  most of the hashtags you use should already be popular and known to an audience. By using tags that are frequently searched, youll greatly increase the odds that your content will appear in more hashtag searches, and reach more eyes. You can measure the popularity of trending hashtags by researching right within social media platforms like Twitter and Instagram. This is a great place to get started when choosing hashtags for your brand. Think about what speciality areas your company focuses on, and what common hashtag is fitting with that theme but also generates a lot of engagement, and use that as a starting point for identifying the right tags to include in your posts. While most of the hashtags you include in your posts will already exist and serve the primary purpose of getting your content found, hashtags can also present an opportunity to showcase your brands creativity. This presents an opportunity for your brand to really start something with your audience and be associated with a certain term. Its important that consistency and relevancy be the overarching goal as you develop a hashtag trend. Alternatively, you can try using a pop culture reference and align it with an aspect of your brand. This technique is an excellent way to demonstrate that your brand is connected to the population and not just out to sell a product. This may sound like it goes against common sense, but as useful as incorporating hashtags can be, its also possible to overdo it (#nofilter #jktheresafilter #really?). Too many of them in a single post and your message will read like spam, which could deter social media content consumers and eventually cause them to unfollow your brand. While there are multiple opinions about the optimal number of tags, youre generally safe with one to three per post. Think of viewers of your content as dedicated readers. When it all boils down, hashtags are a distraction that detracts from the message youre trying to relay. Include them by all means, but always do so in moderation. Too many hashtags may still garner more likes, but at the end of the day, those users probably arent a fit with your brand, and arent going to lead to any further engagement, leads, or growth. Focus on quality over quantity. Hashtags have become an incredibly important aspect to nearly all social media campaignsthey put your brands efforts into a single categorized subject, and make it easy for your audience to access what youre posting. Whether youre looking to extend the reach of your posts, start a new trend or share your overall messaging, always focus on quality over quantity. For this particular social media tactic, and like most marketing methods, relevancy is key! Since you are here, why not check out our work on how to analyze your Digital Marketing campaigns in 2018.